Genuine Eaton Fuller transmission parts, everything you need to completely overhaul your transmission. 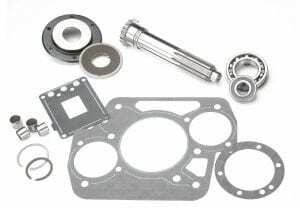 We sell rebuild kits, bearing kits, bearings, gasket kits, gaskets, master re-builder kits and remember to check the input shaft, air hoses, synchronizes, shift fork, O-rings, main shaft drive gear, countershaft drive gears, and countershaft, overdrive gears for wear and damage. The main shaft overdrive gears, shafts, slave valve, shift knobs, m/s washers, m/s key auxiliary washers should always be checked before being installed. Remember to always inspect the front bearing cover, output seal, snap-rings, and clutch shaft bushings, sliding clutch and electronic controls, speed sensor, shift tower, for damage. We also sell the shift sticks and knobs, shifter, range valve, speed sensors, and splitter cover for 13 and 18 speeds, shift tower O-ring, clutch brake, air system, tapered roller bearings, ball bearings, cylindrical roller bearings, yokes, cases, bell housings, snap rings, O-rings and bushings for most models. We are your number one Eaton Fuller transmissions parts supplier! We stock parts for Fuller mid-range transmissions to Fuller Roadranger Auxiliary (AUX) transmissions. No matter the Eaton transmission model you have, we have the parts, rebuild kits, or overhaul kits for it! We have decades of experience in rebuilding transmissions and specialize in Eaton Fuller transmissions, so we know our parts. Our transmission experts can help with any kind of questions if you aren’t sure which parts you need. Download the Eaton Fuller transmission parts list PDF breakdowns and PDF service manuals for your transmissions. After we find the parts you need, visit our web store stocked with close to 100,000 parts where you can click and buy instantly from us right to your door.